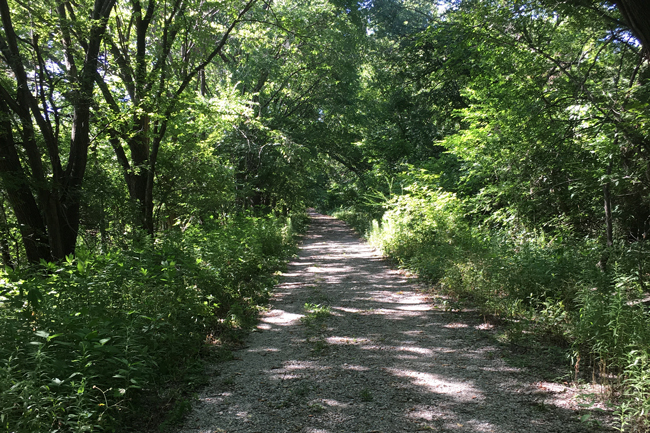 Nestled amidst the urban development that continually claims land for new housing subdivisions or office complexes or retail centers in our area, the Connemara Meadow Preserve is a surprise of natural beauty. Earlier this week, I set out and found the almost hidden entrance road to this land conservancy area. I discovered a wonderful place for walking/hiking and captured several items for the 2018 Seasonal Photo Scavenger Hunt. 1. After parking near the gated entrance, I was delighted to find a wonderfully shaded road that leads to the meadow. 2. 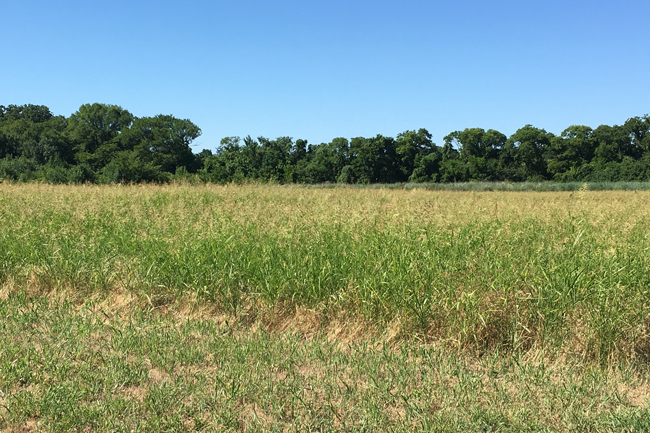 The conservancy is working to restore the meadow to native grasses, although there are still areas covered with invasive grasses. I'm not sure whether I've captured native or invasive grasses for (#10) A Field of Plenty. 3. 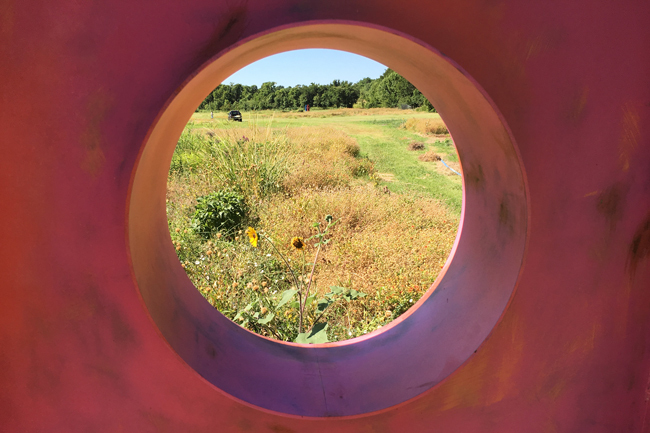 This summer there's a sculpture exhibit in the meadow. 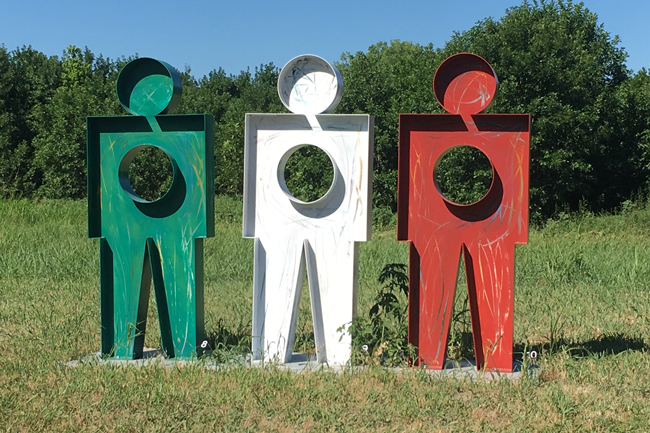 All the sculptures depict the human form, and numbers 8, 9 & 10 make a perfect scavenger hunt find for (#14) A Trilogy of Three. 4. Human Nature Figure Number 1 provided the perfect opportunity to capture (#3) A Framed View. 5. Although it was terribly hot, it was so nice to have a chance to walk in nature rather than on paved sidewalks for a change! This was my first visit to this preserve, but I'll definitely be returning! Are there any land conservancy areas near you? Solace is defined as "comfort or consolation in a time of distress or sadness." 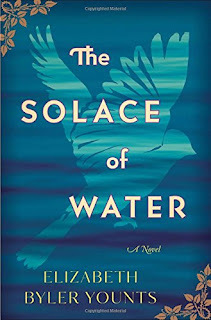 In Elizabeth Byler Younts' hard-to-put-down novel, The Solace of Water, we meet three women who are in need of solace. Delilah - a mother grieving the death of one of her children. Emma - a wife hiding the secret of her husband's addiction to alcohol. Sparrow - Delilah's teenage daughter struggling to deal with the guilt of her brother's death. This beautifully told story is set in a small town in Pennsylvania in the 1950s and is told through chapters that alternate between the three perspectives of Delilah, Emma and Sparrow. The book opens from Delilah's perspective. From the first sentence ("My skin was the same color as the soil. "), we are drawn into her story. 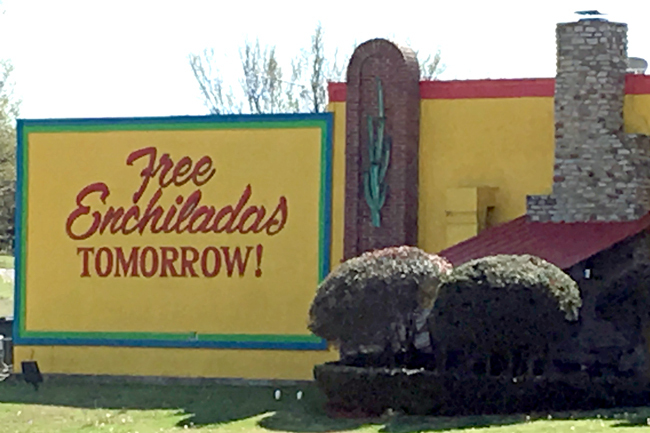 Delilah and her preacher husband move their family from Alabama (where there are signs and customs that dictate where blacks can eat and shop) to the north (where, supposedly, blacks have much more freedom). The move is designed to give the family a fresh start after the death of their young son; however, Delilah finds it hard to move forward and keeps herself distant from their new community and church family. Behind their new home, there's a wooded area with a creek, and on the other side of the woods is Emma's home in the Amish community where her husband serves as a deacon. While Emma strives to hide the fact that her husband is drinking the communion wine, she continues to grieve for the premature daughter she lost years before. The Amish preacher admonishes the community to avoid contact with the whites and blacks in the small town as much as possible to avoid getting drawn into the conflicts that arise when a young black boy falls in love with a young white girl. Sparrow often retreats to the woods, and eventually to Emma's home, as she avoids her mother and the rift that has come between them since her brother's death. Sparrow is also befriended by Emma's teenage son, who is also caught up in his parent's secrets. As the story progresses, these three characters form friendships that help them eventually begin to overcome their grief and move forward in their lives as they each find solace. There's a beautiful scene in the book when Delilah is wandering through the woods in her grief. It's a Sunday morning, and at one point she looks out toward Emma's house and sees a line of black buggies beside the barn and hears loud, slow singing coming from the Amish community's church service. She then meanders back toward the other end of the woods and looks out to see her church - the yard is filled with cars and she hears singing (a livelier beat with clapping) coming from the Sunday worship service. What a poignant reminder that despite their differences, there's much that is similar about the lives of Delilah and Emma. Along with the main theme of friendship, there are many deep topics woven throughout this novel - grief, prejudice, kindness, love, secrets, guilt, forgiveness, etc. I highly recommend this book (which I received free from Booklook Bloggers in exchange for an honest review)! 1. 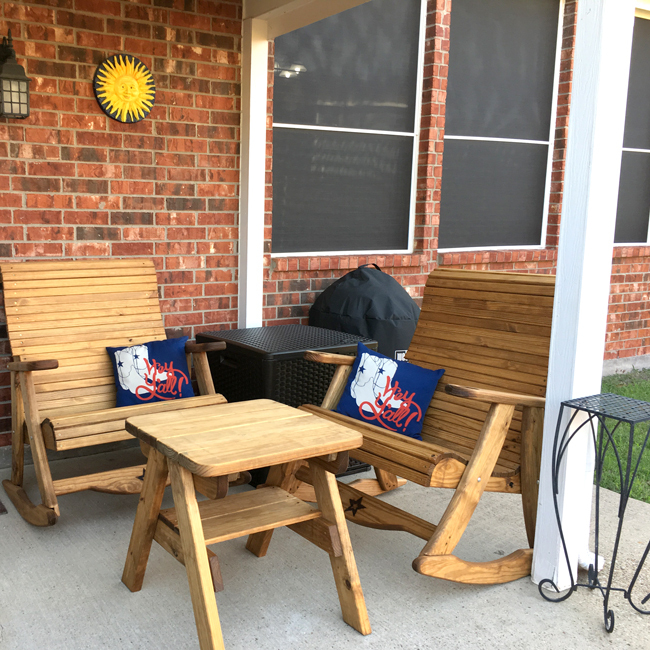 We got new rockers for the patio several weeks ago, which has been a wonderful "excuse" to spend lots of time outdoors! 2. 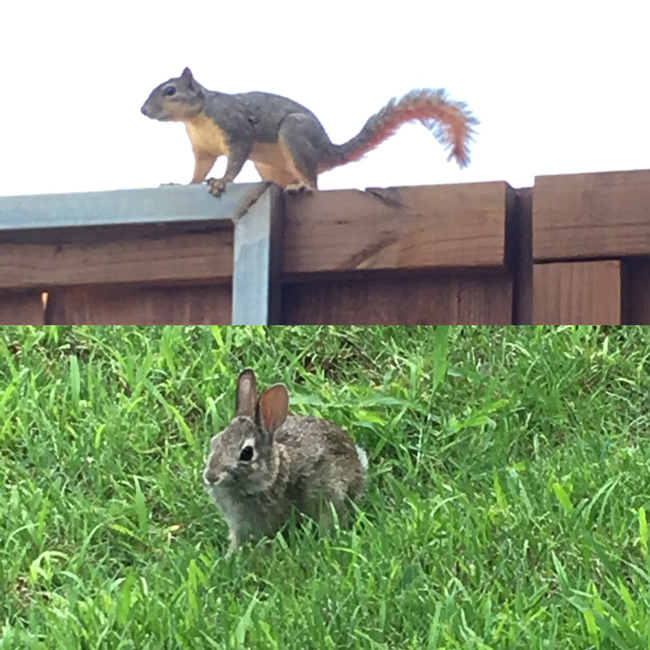 We often have "visitors" when we're out relaxing in the new rockers. 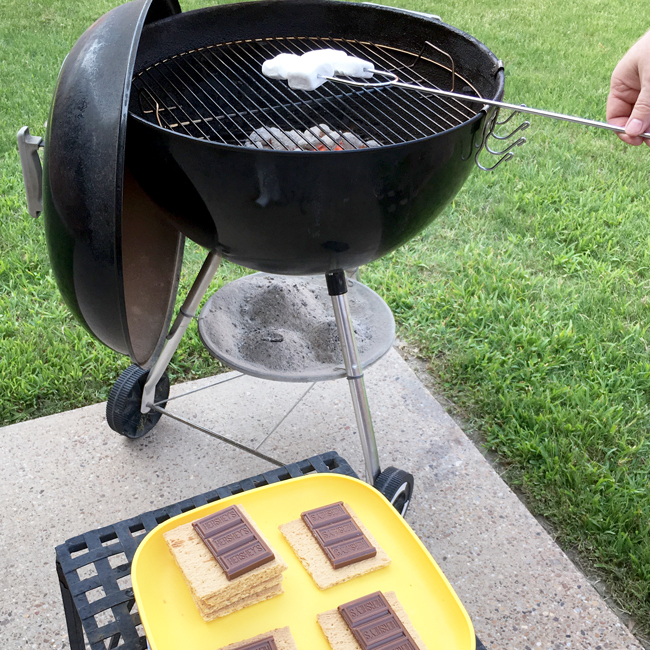 5. or smores for a yummy snack! I have to admit, however, that there is one problem with the new rockers. Once I go out and sit down in one to read or relax or just enjoy the sunshine, it's almost impossible to get myself back inside to do anything else. It's not really necessary to do chores in the summer time, right? 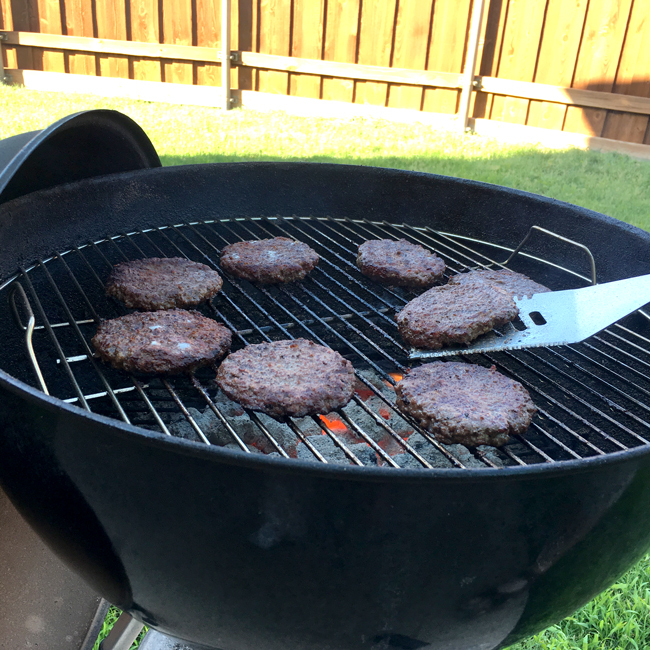 In my mind, summer begins on Memorial Day weekend (the last weekend in May) and goes through Labor Day (the first weekend in September), although we often have summertime temperatures earlier and later than these dates here in Texas. However, as today marks the official first day of summer, I thought it'd be the perfect time to share some FUN activities I have planned for the next few months! 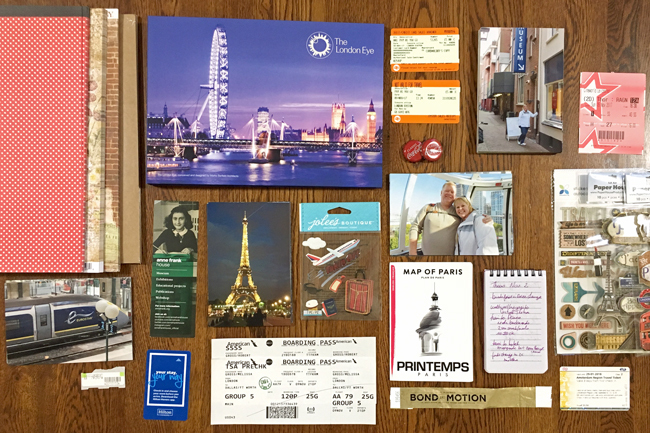 I've printed photos, gathered memorabilia, and purchased some papers and embellishments so I can scrap the stories and memories from our Europe trip last fall. I'm planning to join in with the 2018 Seasonal Photo Scavenger Hunt hosted by Mary-Lou at Patio Postcards. In fact, I captured a photo for (#7) An Unexpected Reflection as Robbie and I were walking at a local park earlier this month. 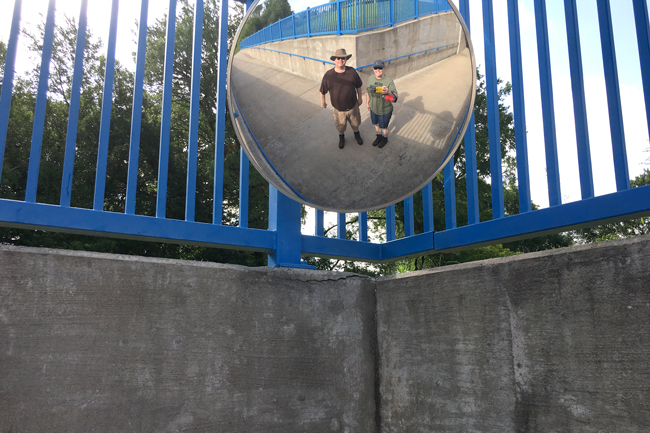 We noticed a ramp that led under the street to another (much shadier) trail, and as we were coming out on the other side, we caught our reflection in the corner mirror! 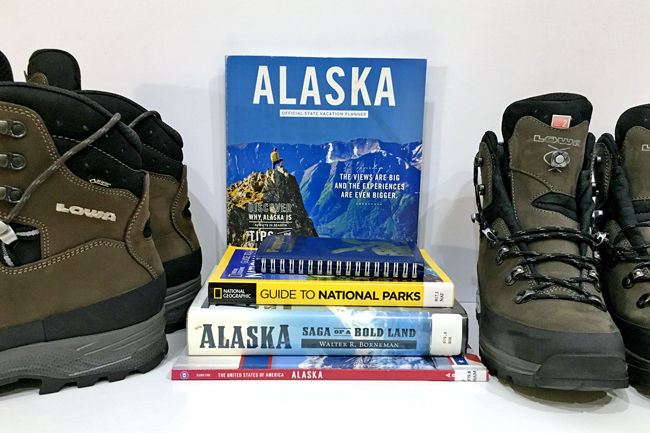 We're busy finalizing plans for a two-week trip to Alaska! 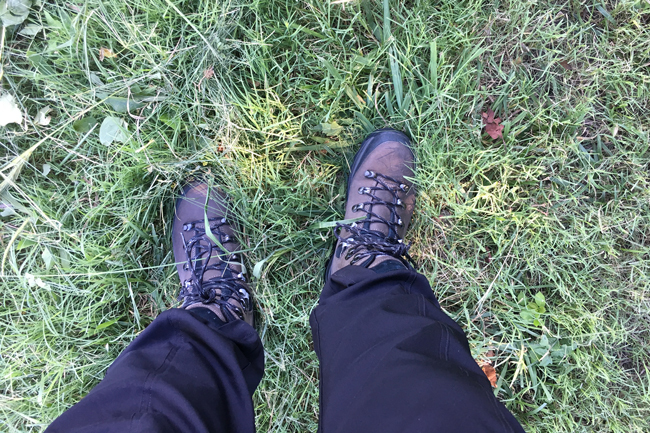 We sent off for a vacation planner, checked some books out from the library, and are breaking in our new hiking books. After the past couple of months "off," I'll also be back here on the blog sharing scrapbook layouts, handmade cards, crafty projects, Bible journaling pages, book reviews, travel photos, everyday adventures, and other FUN bits & pieces of our wonderful life. 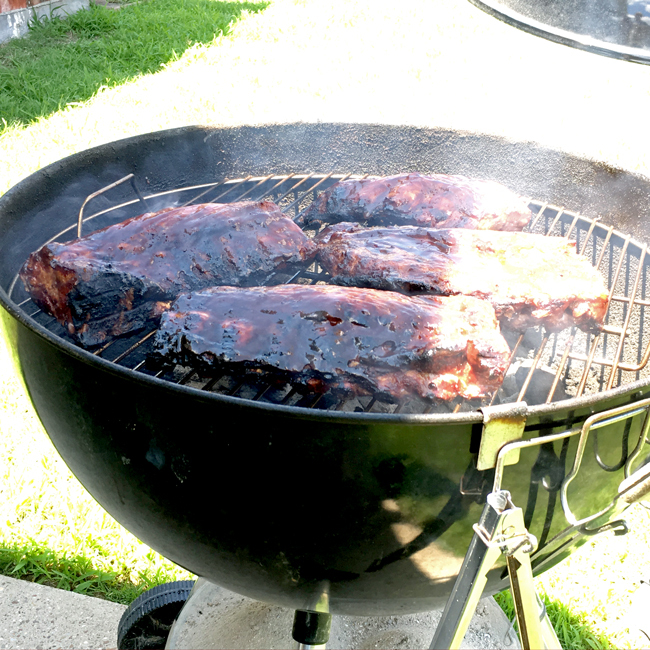 What do you have planned now that summer has officially arrived?